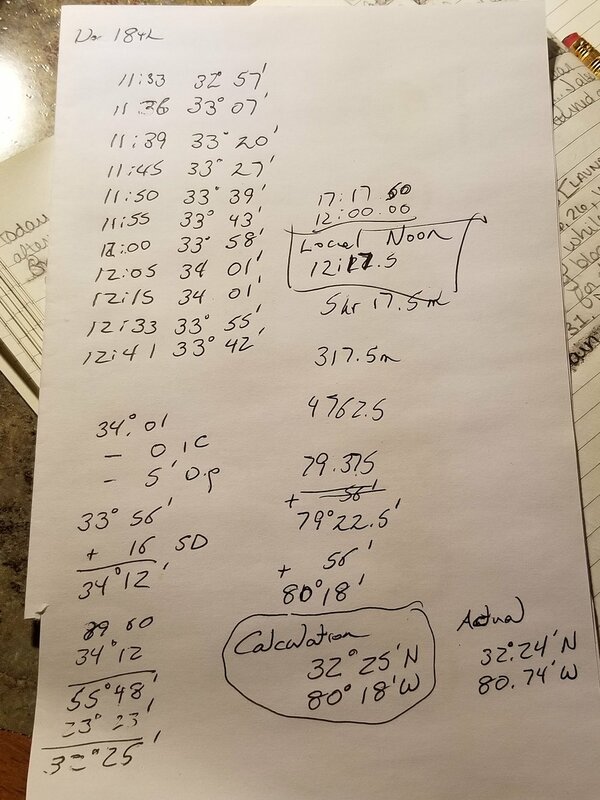 12/18 Tuesday, 59/46, sunny, N5-10 - This morning, I finished writing yesterday’s log entry while making coffee. After breakfast, I created a corresponding blog page. Then I went to work on a detailed estimate for improvements and maintenance on an Island Packet 31. Dobbs took noon sights with the sextant and was darn near spot-on with our position. Earlier in the day, he helped a powerboat neighbor flush his engines with fresh water (the manufacturer recommends doing this after every use). Shortly after lunch, the package with our rigging gear and mail arrived! Dobbs grabbed our splicing tools and made the rope-to-chain splice with our new chain. I’ll admit to being nostalgic for home - I sniffed the inside of the splicing bag! Beeswax from the whipping twine, leather palms, honing oil…sweeter than perfume to me. I hoisted our Hances Point Yacht Club burgee too. I’d like to leave it up all the time, but the racer in me sees the turbulence it makes and takes it down when sailing. I perused the mail, taking special delight in a birthday card from my Mom, a Christmas card from family, and two new magazines. I found places to stow the newly arrived tension gauges and climbing halyard, and then filled the box with empty jars left from the canned food we’ve consumed. The box was a perfect fit for both the jars and our quarterberth. Dobbs loaded the anchor rode back in the locker and then went to walk the docks, doing “meet and greet” with Walden Rigging flyers. Murph and I took a one-hour walk. As we were heading out, Dobbs introduced me to the folks with the Morgan on which I’d pointed out the cracked forward lower shroud chainplate in the “Burkes Beach” blog post. They thanked me for spotting it and Dobbs for letting them know, and offered to help with driving if we had need of a car (they’re local). I also met Rich, who just came in on a Pacific Seacraft 34. He’s near the conclusion of a year-long coastal cruise, heading back to Miami. His steaming light was out, and yet it was a relatively new LED bulb. Dobbs went up to take a look at it. 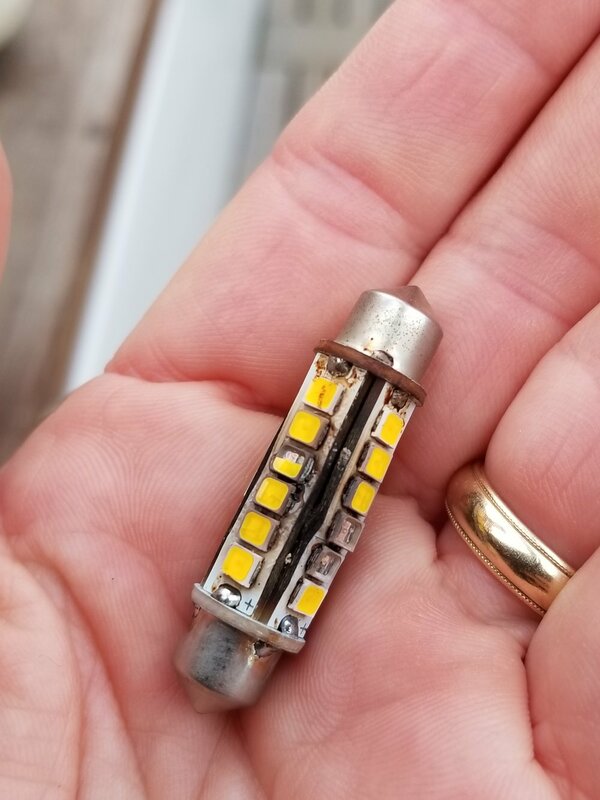 Something shorted the circuitry of the LED and it burned on the inside - it still smelled of electrical fire. Thankfully, the Forespar combination fixture was undamaged. We’ll get Rich fixed up with a new bulb tomorrow. After the work was finished, he came for a tour of Grace and stayed for happy hour. As I was on my way back with Murphy, the office called to say our transmission had arrived (insert toothy big grin emoji). I collected it and carried it back to Grace, then sat down to talk with Dobbs and Rich. Around 7pm I made chicken enchiladas and yellow rice. YUM! The days go by so quickly - I’ve felt like I’m racing bedtime these last two nights. A young girl character in the book I’m reading, “Hotel Honolulu”, describes why each passing year seems shorter - “Because as you get older, each year is a smaller proportion of your life.” I don’t recommend reading the book, but this character seems wise for her years.